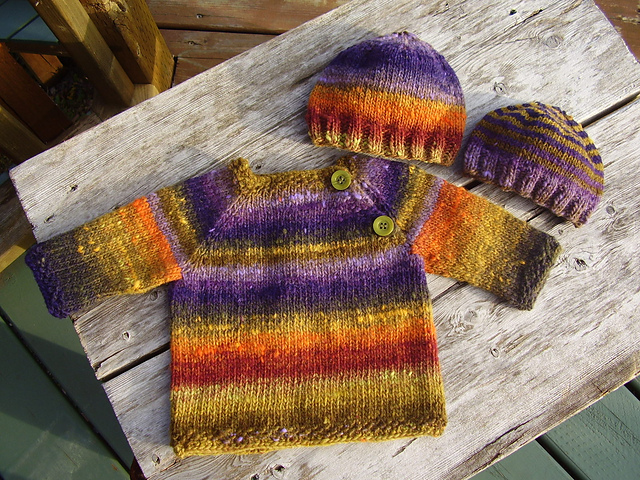 Okay, this FO has been done for awhile. Truth be told all it needed was a bath but a mild but persistent upper respiratory virus attached itself to this pregnant body and I lost all will to do anything but play with Jellybean while simultaneously laying on the couch and then surf Instagram after he went to bed for like a solid week back in early April. Nevertheless, here is the Baby Vertebrae for PB!! I’m super jazzed about this sweater and I hope it fits for fall! Either way I really hope this becomes and heirloom piece for PB to save…. 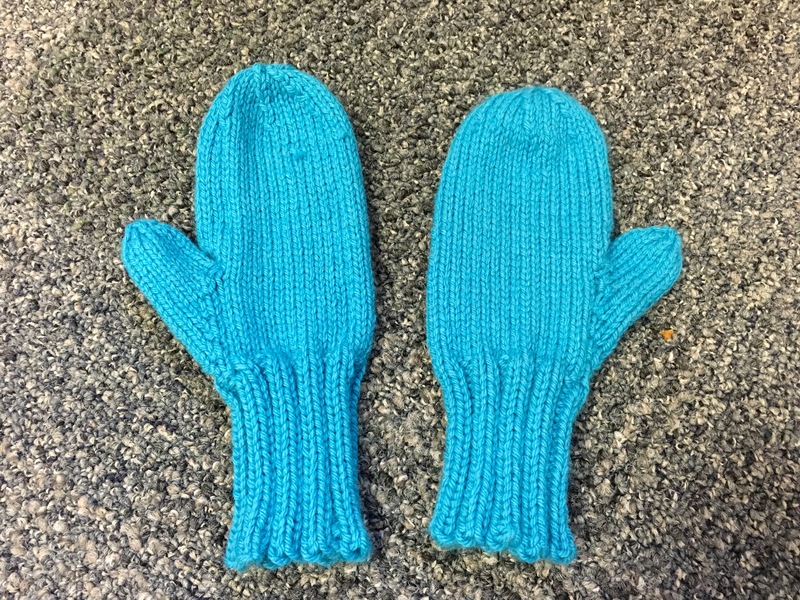 I whipped through the mittens for Jellybean this week! I love these finished objects despite the fact that I had to use dpns in the round. I’m getting ready to throw them in a bath to wash and block to even out the stitches. I haven’t yet dared to show them to Jellybean because I would never get them back! He’s got quite the glove obsession of late. And with they thought I’m off to start a second pair! I’ve been on an organizing tear of late. I went through my wardrobe with a ruthless eye and got rid of the clothes that don’t fit post baby. And the ones that don’t make me happy or feel good. They will go to a good home to my sister or to a women’s shelter. And I also tore through my WIPs pile. It was time to knit or frog. I unearthed my Cuff to Cuff Sweater. I started this in 2014 but it stalled majorly after Jellybean was born. I was sorely tempted to rip it out as I’m not sure it will fit my new and improved mom hulk shoulders. But all it was missing was one sleeve and the collar/edging. Still a lot of knitting to do but it seemed a shame to undo. I can always gift it to my cousin or sister. 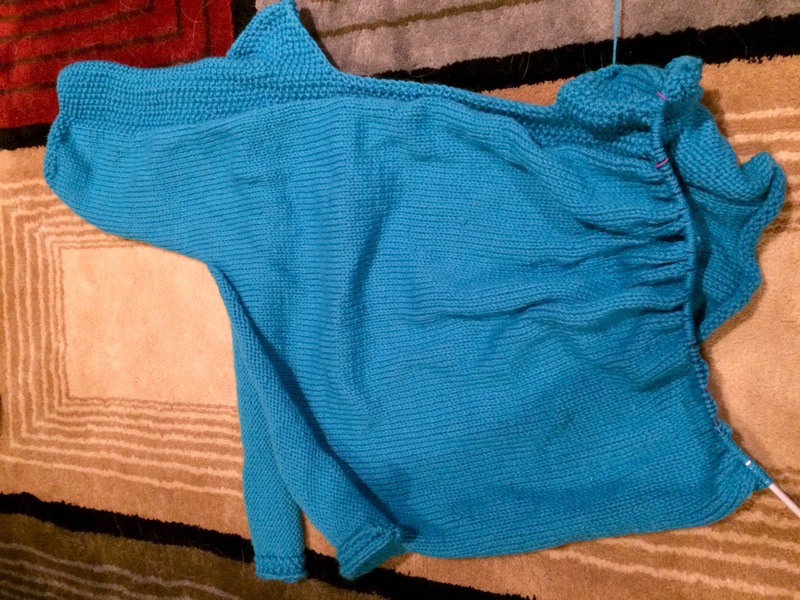 It’s knit with Berroco Vintage in a teal/blue. I picked the yarn up for a song when a LYS sadly closed its doors in 2014. Also, if I finish this before Christmas I can count this as another WIP interception for the Down Cellar Studio pigskin party KAL! My sweater is growing! 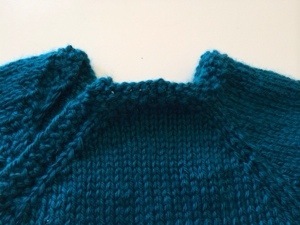 Here is the latest progress on my Cuff To Cuff sweater! I feel a bit like a proper knitting mother today. 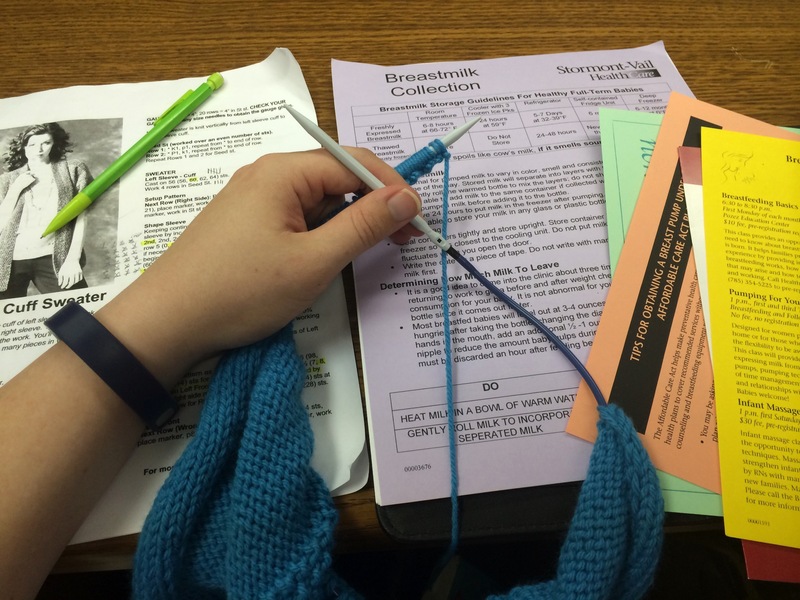 Who says you can’t take a breastfeeding class and knit your Cuff To Cuff sweater at the same time? I’ve finished the first sleeve just knitting in class and cast on the body stitches. Not to mention learned a million things about nursing. I call this day a win! Now that the pressure of Jellybean’s blanket is off and I’ve started the nursery bunting, I’ve finally let myself start my fall sweater! 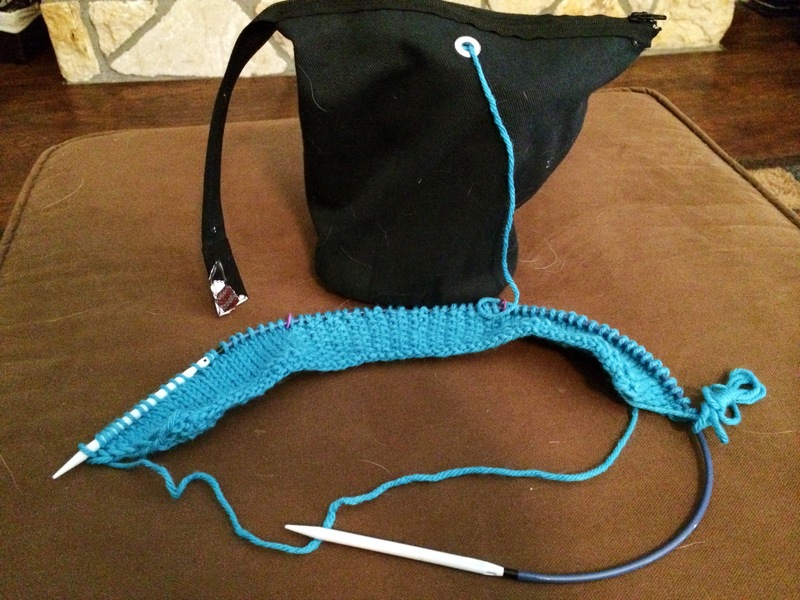 The yarn has been wound, pattern read/notated, and the whole shebang organized into a project bag for a couple of weeks. I can’t tell you how excited I am to get my fingers into this yarn!! It’s some Berroco Vintage in a luscious teal I picked up at a yarn shop going out of business awhile back. This color just makes me happy! 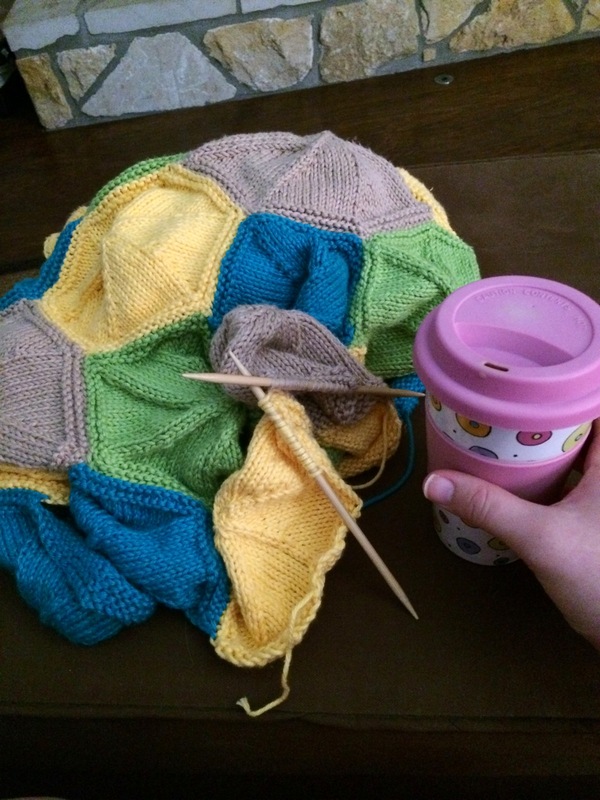 What makes you happiest about your current WIP? Happy Labor Day to those in the US!! Of course it needs a good bath and blocking to flatten out the hexagons. And I plan on crocheting a simple single crochet border, probably in green? So it’s not done but oh so close!!! For a memory refresher, you can find the pattern here. 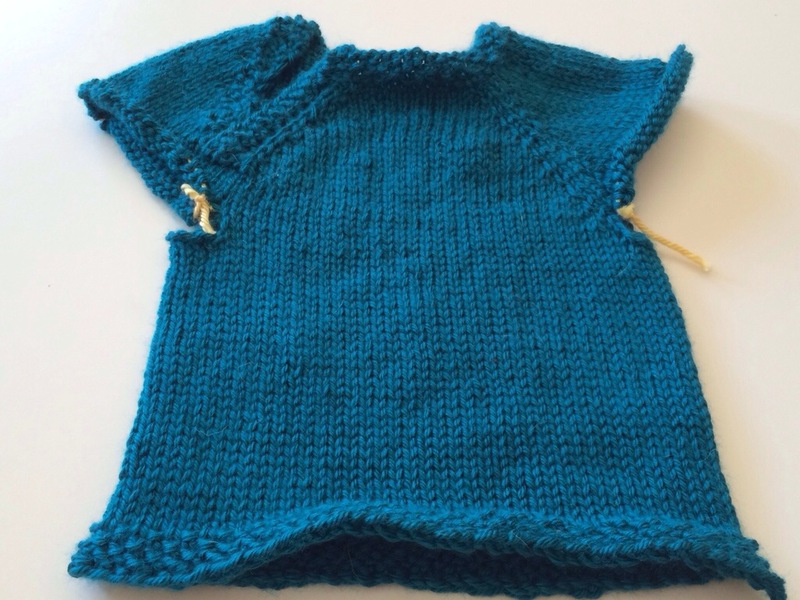 I’m making the smallest size using Caron Simply Soft in Pagoda. My cast off edge at the bottom has quite a bit of curl….I may or may not rip it out and re-do it. I can’t decide yet. Next up, sleeves!! I do love the side vent opening for baby’s big noggin. What a great way to get a good fit and not smush baby’s face as it’s going on! 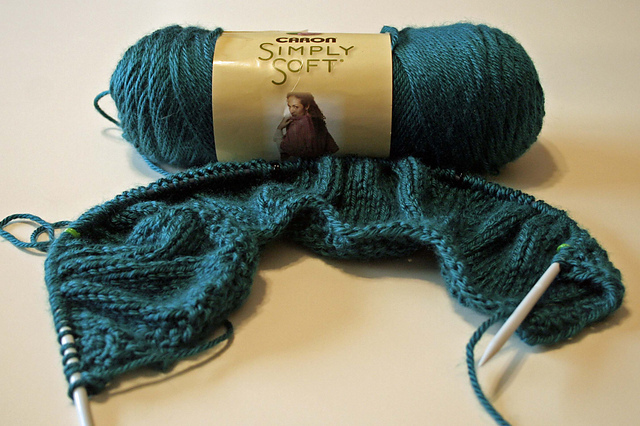 Bolstered by yesterday’s gorgeous sweater and a ginormous case of start-itis, I cast on another baby sweater. Baby fever + start-itis = more WIPs than my husband can handle! But how can you resist this? Assisted Hatching by Elizabeth Ditchburn Dew…. 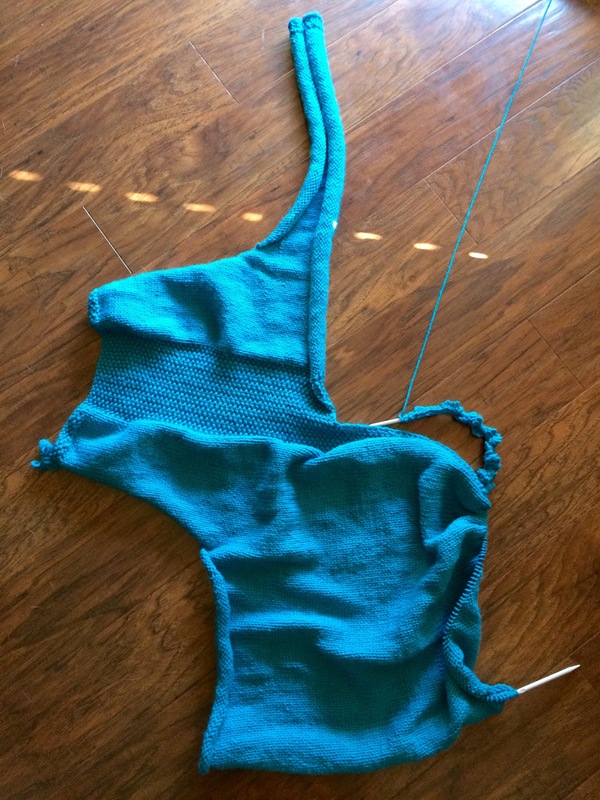 I’m really glad I have two sets of interchangeable needles, lol…..because I have already made good progress on this sweater!